My payment is failing. What can I do? Payment did not go through? Here is how to find out why your payment didn't work. We are sorry to hear you are having trouble funding your project. If your payment via Credit Card failed, please try again one more time, and please double-check the payment information was entered correctly. To get back to the payment screen if it went away, please refresh your browser window and it will pop up. Or it will appear if you log out and back in to the site again. If it still doesn't work, then please use our PayPal option by clicking on the PayPal logo on the payment pop-up screen. The other option is to contact your bank in order to get your transaction cleared. Our payment processor is PAYMILL and they are located in Germany. If you are in the US, it's likely you may need to authorize the transaction with your bank. You can do this by calling the phone number on the back of your credit card. Using AMEX? If so, you'll need to use that card by paying through PayPal as our payment processor PAYMILL only accepts VISA or Mastercard. 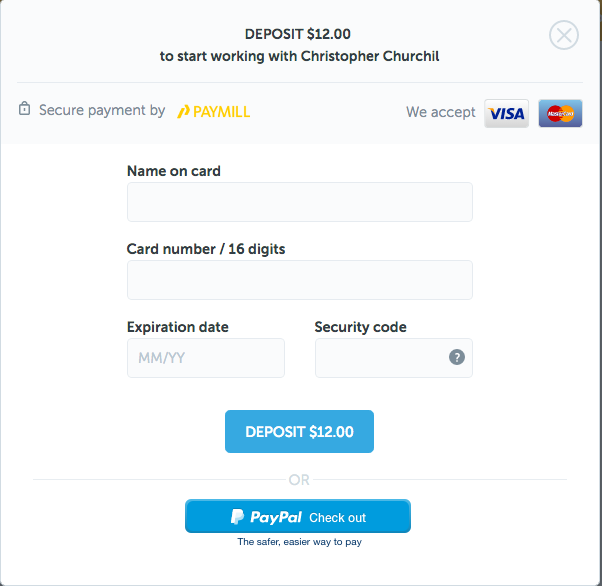 Still cannot pay with PayPal or PAYMILL? You can make a direct payment to Codeable's PayPal using our PayPal email (paypal@codeable.io). When paying make sure you enter the correct amount and note the task ID on the payment. Please reach out and let us know when you've done this. Once we see the funds in our PayPal account we mark the task as paid. If in doubt, don’t hesitate to contact us at support@codeable.io or click on the live chat icon in the lower right corner of our website.